I had the pleasure of meeting with Joanna Sipos as the Mississauga Wearable Art show a few weeks back where I discovered her stunning one-of-a-kind pieces from Belle Boutique first hand. I fell in love with the eclectic mix of materials, vintage and new, all woven together to create one unique statement piece. 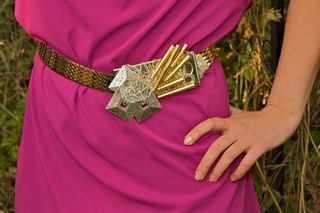 I modeled one particular piece for Joanna, a belt for a client that was interested in purchasing for her daughter. Originally when I saw the belts I thought they were beautiful but I'd never wear one since it's just not my style. Once she put the piece on me I was smitten. Wood and metal merged together and all connected by several large chains. It looked amazing! So amazing in fact that the woman bought the piece for her daughter and I was left disappointed wondering why the heck I hadn't scooped it up when I first saw it. Here are some of her belts. 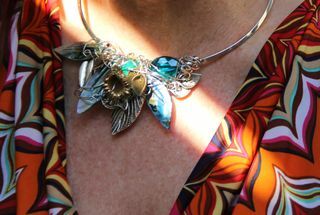 I am going to be paying a visit to Joanna's booth at the One of a Kind Show coming up Nov 22 – Dec 2. I have my fingers crossed she will have something along the same lines as the piece I fell in love with.